The World Photography Organisation announced the winners of the prestigious Sony World Photography Awards 2014 in the Open, National Awards, and Youth categories on Wednesday. The winners were selected from over 70,000 entries submitted by photo enthusiasts and amateurs from across the world. We begin with the winners in the ‘Open to all’ category, where the best single photographs were selected in the competition’s ten subcategories. From slide 11 onwards, the winner entries in the ‘National Award’ category are presented. Photographer’s caption: I was on Durga puja festival vacation, travelling on a local train. A boy was singing devotional songs and begging for alms. He was guised as a Hindu god, Lord Shiva. This is a common view in Indian trains. But this boy was charming, bright and did have a melodious voice. He could not earn any money from the compartment and was sad. He was singing alone, standing by the door. Our destination was arriving and we approached the door. My camera was ready, hanging on my neck, with the 20mm wide lens attached. I took 3 shots of the boy and got off the train. Before leaving, my daughter gave him an apple and I gave him some money. The boy moved to the next compartment happily. These children are from very poor families. Their parents work as contract workers on very poor daily wages. They work day long in the fields. The children sing and beg for money to earn bread for the family, when their parents cannot manage a contract. Yet they are cheerful, happy and friendly. Photographer’s caption: This image took me few months to complete. It started from an idea, a clear vision. 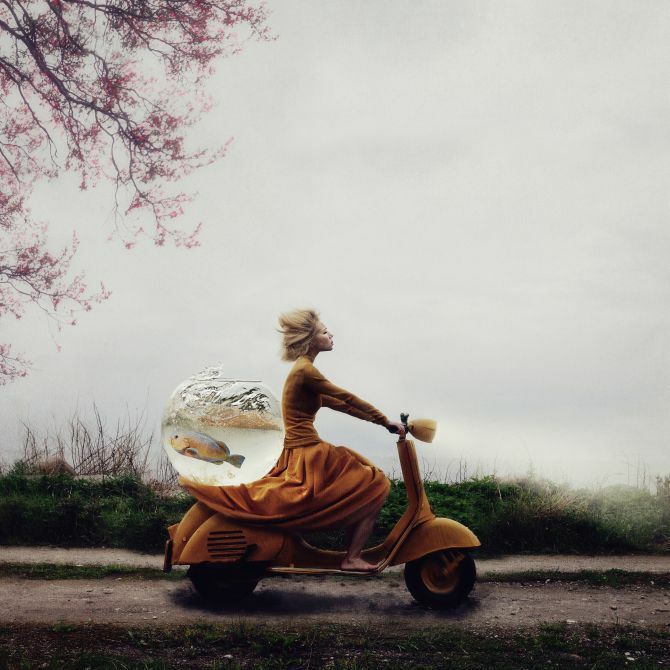 It is a daydream about a getaway or rescue, a story with an open ending. I would like to leave the final interpretation to the viewer. Technically I didn’t really know how to accomplish an image like this, so I ended up doing some experiments that did not turn out good. After some trial and error I decided to just let this idea wait a bit, I collected the props, found a suitable location. Finally when I was ready, I took all the photos in the same location and then composited them together in Photoshop. Difficult part was the fish bowl. There was a sea near by and my friend helped me to carry it. The fishbowl got rather heavy when we filled it with water and we almost fell with it on the slippery rocks when trying to carry it up from the shore. Luckily no one got hurt and the fishbowl is still in one piece today. 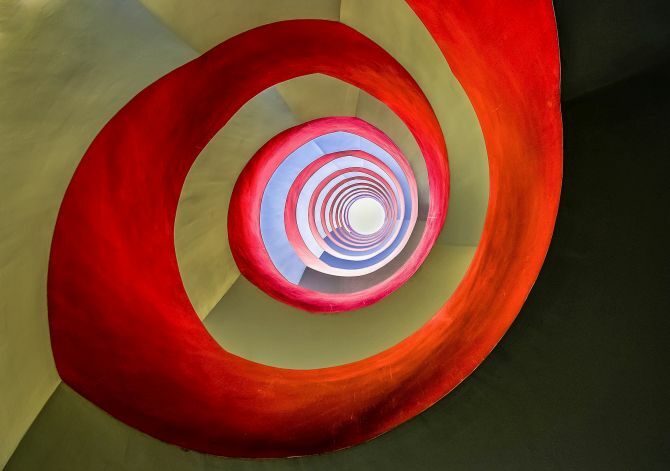 Photographer’s caption: I've seen similar images of staircases and so I tried to do it my way. In an office-building in Cologne I went down to the zero-ground of the staircase. I spread my tripod to get a near bottom position and fixed it in the middle of this motif. With the wide-angle 10-24mm lens I took some raw photos. 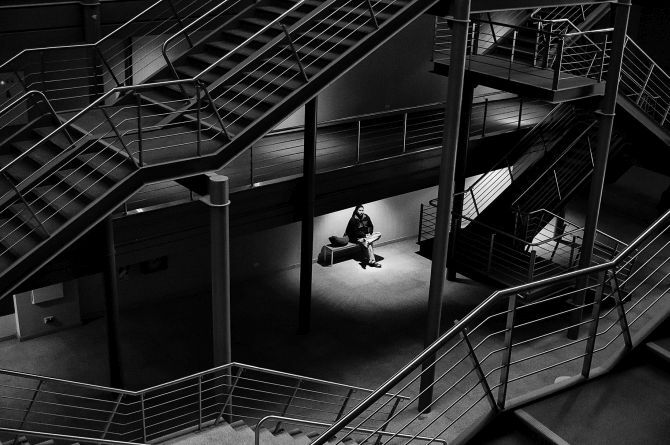 The image ‘Under the staircase’ is one of them developed with LightRoom. 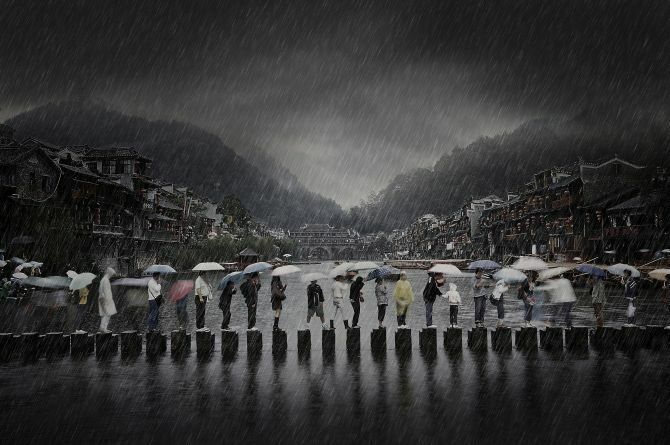 Photographer’s caption: My photo "Rain in ancient town" was shot in southern China’s Phoenix town, which shows the scene of people traveling during the rainy season. A tripod was used for this picture and I used slow shutter on purpose to combine the static and dynamic status of tourists. On the background there are old residential buildings and an old stone bridge, this combination enabled a more spiritual atmosphere for the photo. Photographer’s caption: I was in Fethiye, Turkey, last summer for work. She wanted me to take her photo when she was in the air. I took this image on a fast shutter speed to capture her in the air jumping into the lake after coming out of the mud bath. The result was interesting. 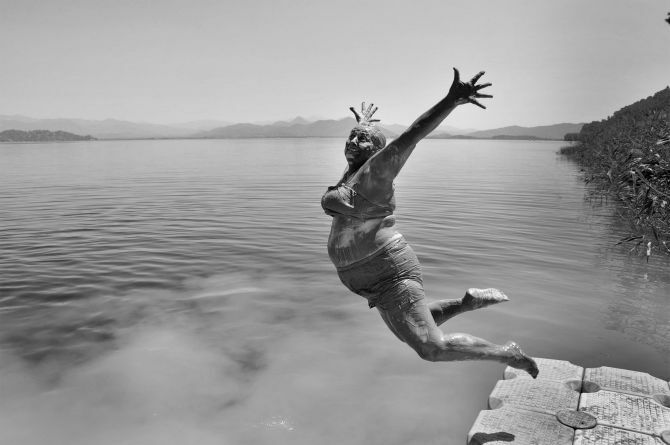 With the smile on her face and the way she jumped, she seemed to prove how insignificant her age was. She was the hero of the day. Photographer’s caption: It was very cold that day, so the inspiration for the title was easy. I had very cold feet. I came out of my car for a quick shot in the snow. The country lanes were slippery. 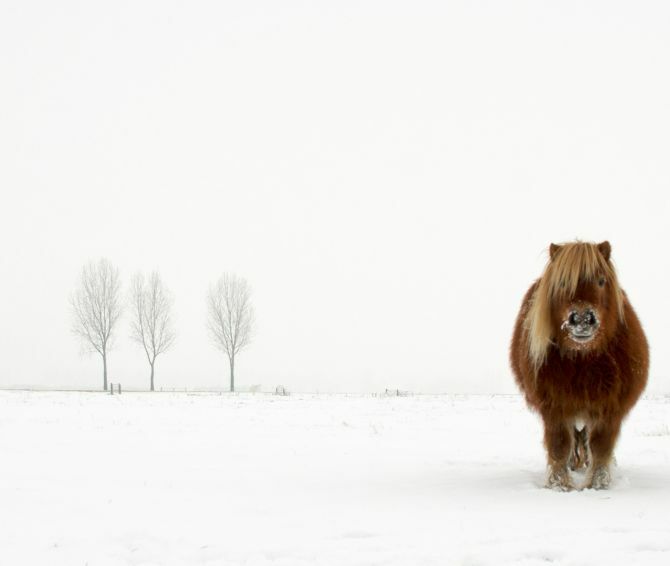 I walked through the cold snow to get to the pony. When I got there I realised that I had the wrong lens on my camera for the effect that I wanted. So I went back, changed lenses, and came closer than wanted. Normally I have my photo bag on my back. Not this day because I wanted to go for a hit and run shot…I went back and changed lenses. I came home with this picture. Somehow I can still feel the cold, and the scene is arctic in my imagination. I took advice to size it this way. Photographer’s caption: Being a photographer is not easy, people may not know the many challenges that photographers have to face to attain the perfect image. Sometimes the story behind the image is much more interesting than what is seen in the picture. It our job as a photographer to convey the story and breath life to that image. 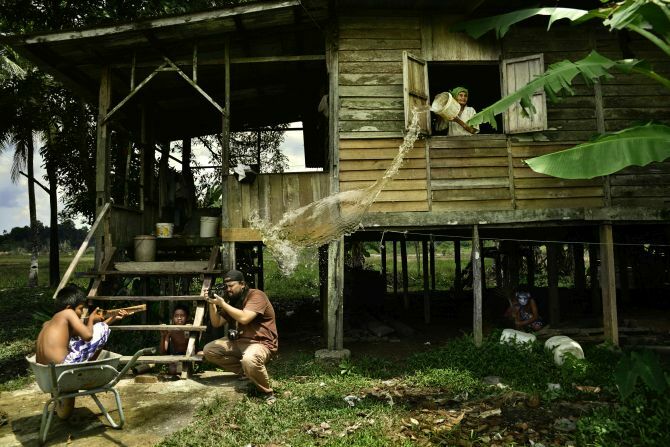 This image, shot in a village in Kuantan, Pahang, Malaysia, was captured in high shutter speed and using available light only. This photo narrates the pains and gains of being a photographer, the heritage of an old house, forgotten traditional games and the old generations meeting the new which complimented each other very well. 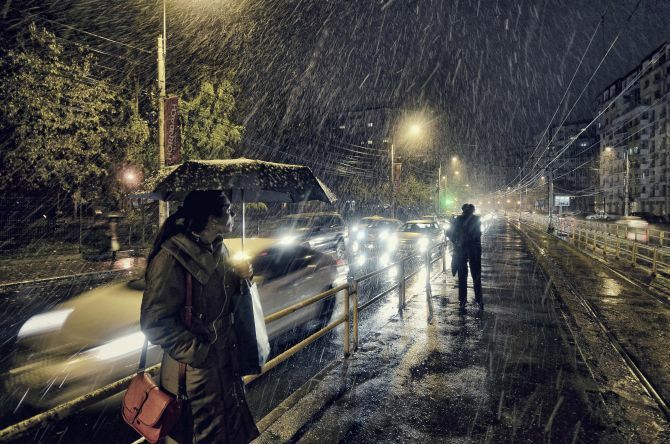 Photographer’s caption: First snow in Bucharest; traffic and passers by are taken by surprise at the sudden cold weather. Photographer’s caption: It's a stitched panorama of 12 horizontal shots, 2 rows, each shot is a long exposure with tripod at 30 seconds shutter speed, f2.8 aperture and iso 3200 on Canon 50D and Tokina 11-16 2.8. It was about 4 am in the night of April 2013, and I was up for capturing the milky way arch form south to north in the lighthouse in Capo Spartivento, south Sardinia. The main difficulty was the right to overlap the shots, also another problem was the bright rays of the lighthouse, I was about 20m away, and I had to cover the lens at the time of the passage of the beam to avoid excessive overexposure, so I timed rotation times of the light beam consisting of four rays and this process was repeated at least 6 times within 30 seconds of exposure and for 12shots. I was fascinated by the landscape I saw in south coast of my island, the lighthouse made everything special. Photographer’s caption: This photo was taken in Branxton, Australia in October 2013. 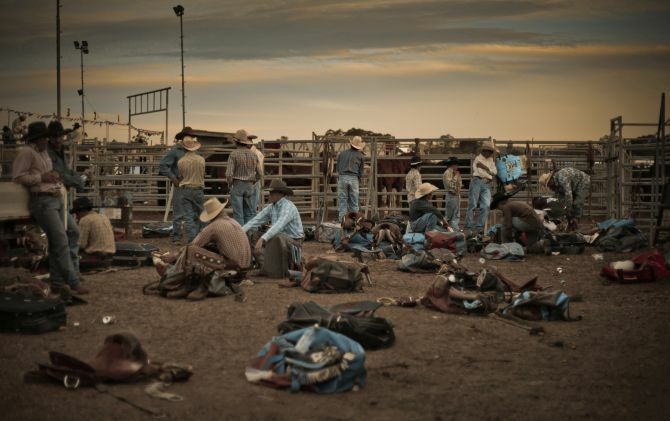 After shooting some of the rodeo itself, I decided to go behind the scene to capture the typical environment of this kind of event. This is when I noticed this group of cowboys having a chat and relaxing. Their specific outfits, their boots, their hats and the horses in the background with the sunset made this photo authentic. This was THE moment and I am glad I took a few seconds to immortalise it. 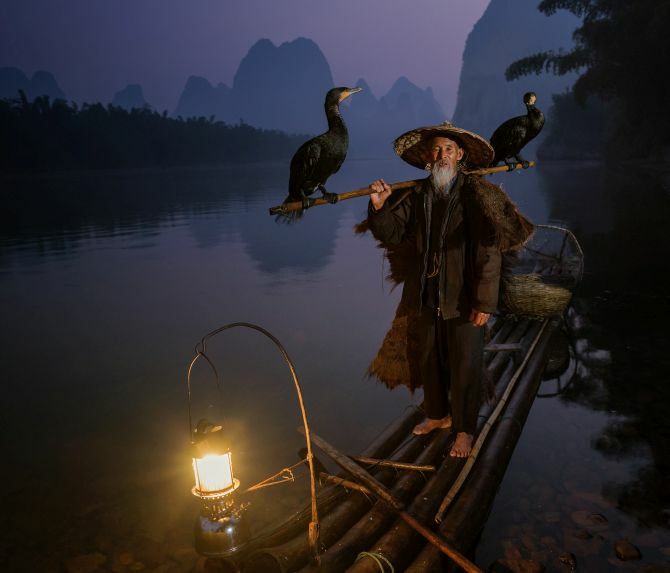 Photographer’s caption: On the Li river near Xingping in China, Cormorant fishermen work the waterways before dawn amidst the spectacular limestone towers of the Karst landscape. The birds are trained to fetch fish from the inky depths but not swallow them. The fisherman accepts the fish from the birds who dive back for more. Here, still before dawn, the fisherman and his birds head for home. 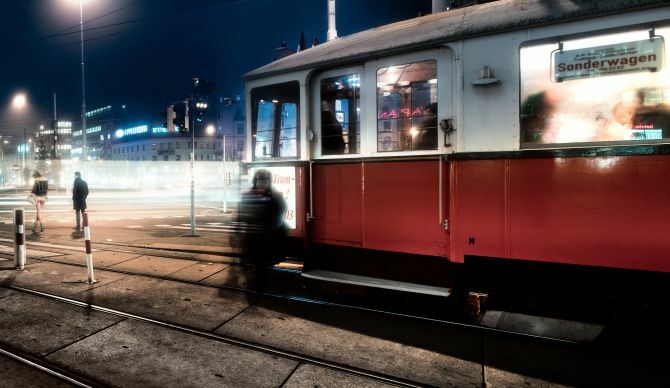 Photographer’s caption: The picture shows a nocturnal scenario at the westbahnhof in Vienna. In the foreground an old tram is stopping. A rare sight that runs only on special occasions. 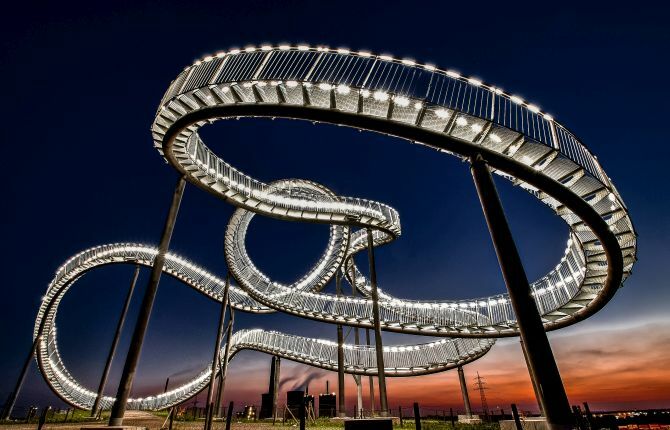 Photographer’s caption: This art work on a hill is one of a few not temporary landmarks in the industrial Ruhr-region of Germany, located in Duisburg. Some photos were taken on a clear summer late evening in the "blue hour" in front of this installation from public area. This image is the result of 5 single Raw-photos produced at least with NIK HDR Efex pro to one HDR-Image and finished with Adobe Lightroom. 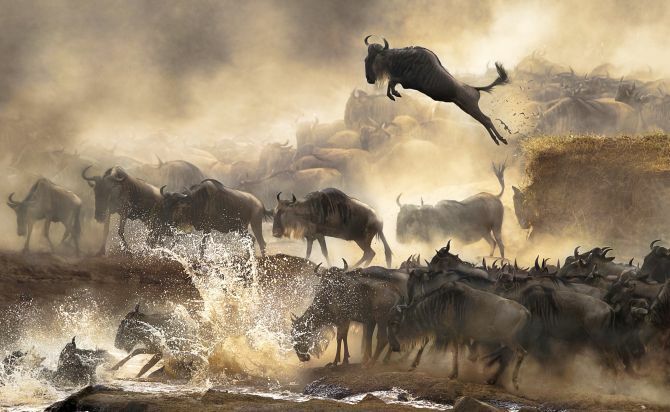 Photographer’s caption: In July each year, this heart-pounding scene of wildbeasts migration repeats itself in Kenyan Savannah. It's wildlife's most dramatic moment! I am so excited to be able to capture this in my camera. Photographer’s caption: The picture was taken after two full days’ efforts. This is the bank of Yamuna river just opposite to the most fabled Taj Mahal at Agra, India. 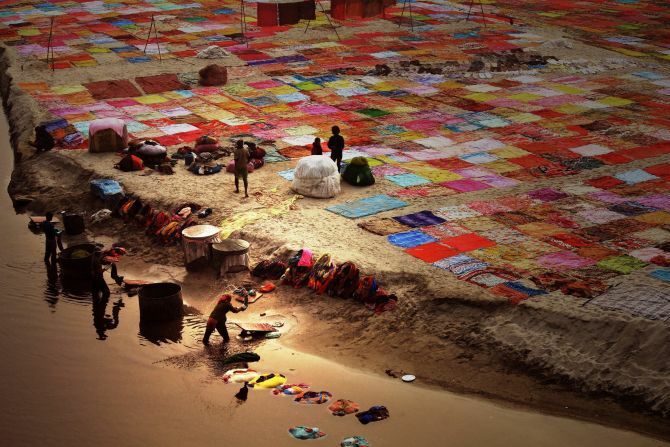 Many people come to visit the Taj from across the globe, but this colourful dhobi ghaat (washermen's den) has, I am sure, gone always unnoticed. I call the opportunity a heavenly chance, because I was travelling in train in the winter morning clicking pictures with my 55-250 lens whenever the train stopped. The Yamuna river had shrunk because of poor rainfall and the dhobi ghat had moved to the centre of the river when the train paused for some signal issue. When I clicked this picture I received an immediate applaud from all my co passengers who were feeling sorry seeing me waiting with my camera and occasionally clicking some drab pictures from the previous day. 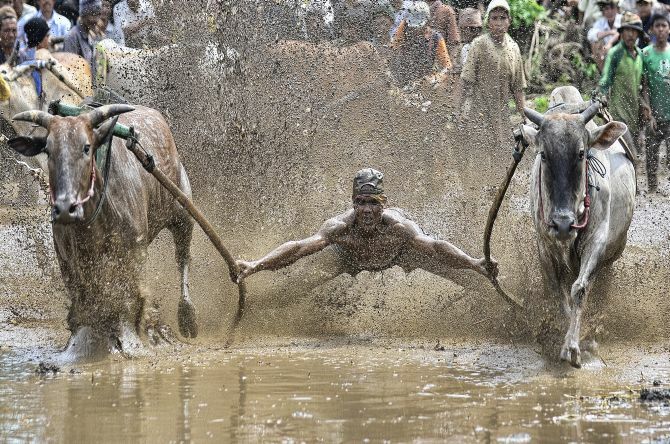 Photographer’s caption: Pacu Jawi or a cow race can be called a traditional game in Indonesia that is contested in Tanah Datar district, West Sumatra. Pacu Jawi has existed since hundreds of years ago. Photographer’s caption: Aimillios, 21, is a young street artist born on the Greek island of Rhodes. Two years ago Aimillios left his family to follow his dream of becoming a circus artist. 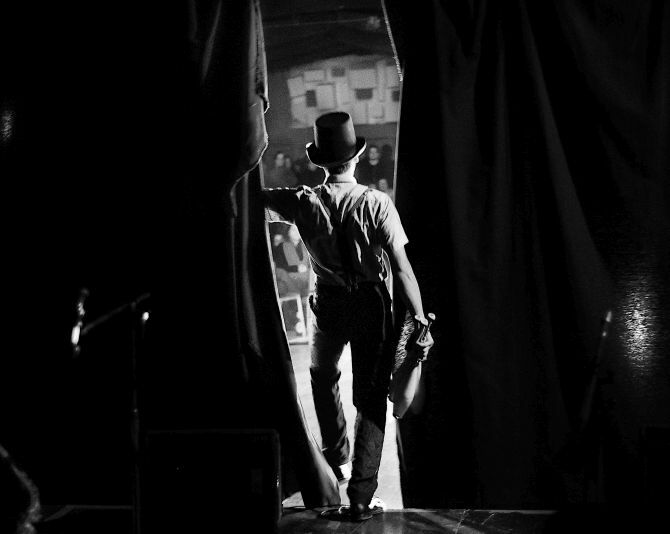 Currently, he's studying at the circus school of Rome and performs as a street artist and in occupied theatres of Rome. 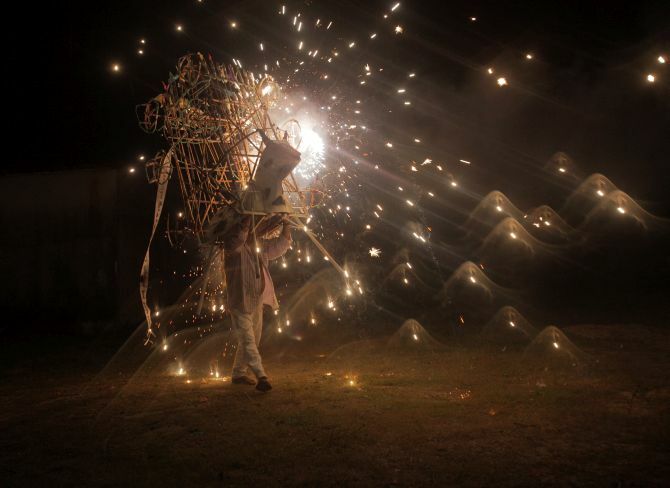 Photographer’s caption: The image portraits a firework "torito" fully in action, during the festivities of La Virgen de la Asunción, in the Mixtec community of Nuu Kann, Santa María Jilaltepec, in the coast of Oaxaca. 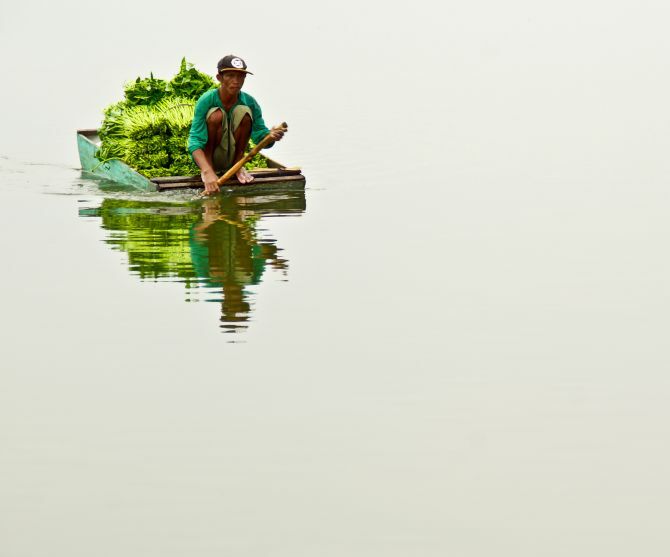 Photographer’s caption: The image shows a unique kind of harvester, who harvests water spinach from Laguna lake. He does not own the area or plantation, but is paid a tiny amount of around $4 to collect the water spinach starting from 7 in the morning until the sunset. 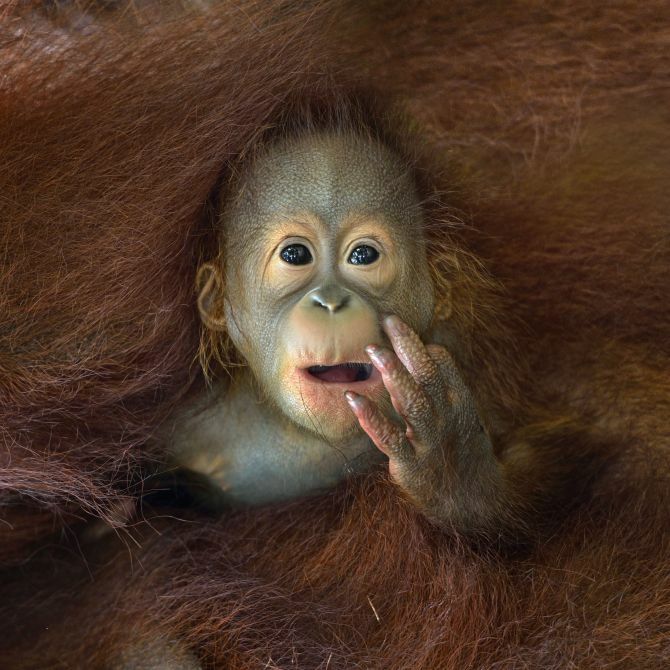 Photographer’s caption: This is an animal portrait of a baby Orang Utan peeking out from its mother's embrace. Photographer’s caption: This photo was taken in Buenos Aires, at a cultural center that works on an old power plant of the Italo-Argentina electricity company, which was inaugurated as such in 1916. After its abandonment, the plant was restored and opened as Usina de las Artes in 2012. The conserved structure I find it captivating to take photographs, especially to people who are intersected with its multiple staircases. This photo is part of a series, still not finished. They show how we are inserted in a random way in the reality that surrounds us, forming particular constellations that demarcate the geometric world in which we live. Perhaps the lines are a kind of graphic metaphor of how we are crossed by marks, histories and circumstances. 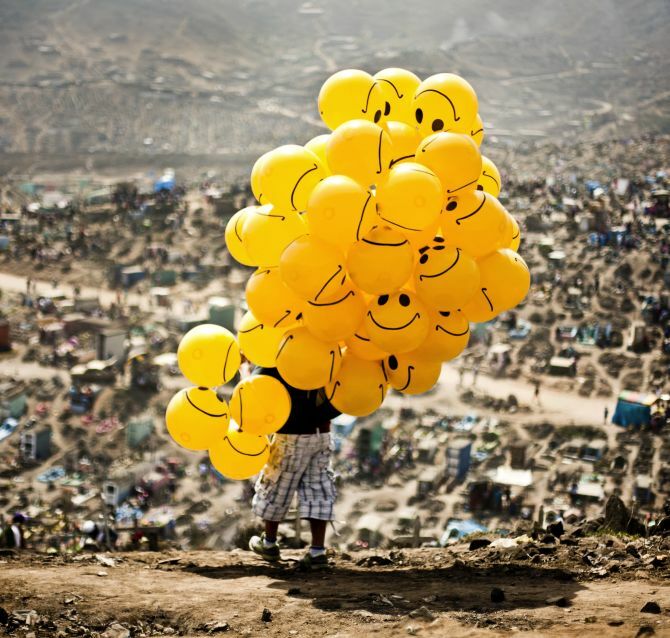 Photographer’s caption: A man sells balloons in a cemetery in Lima in order to cheer families remembering their dead. 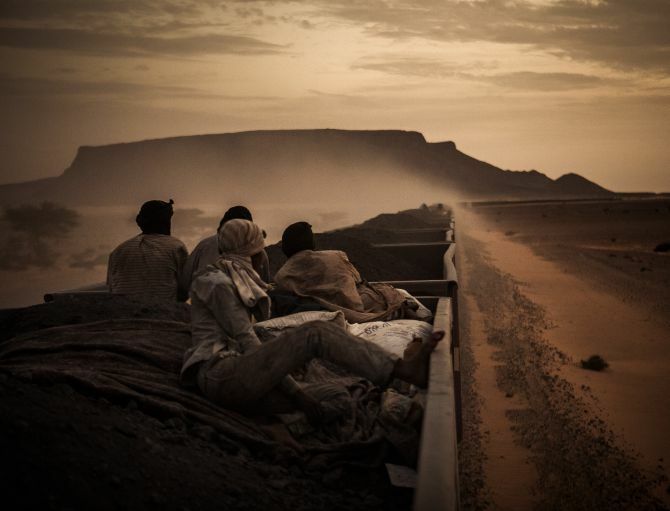 Photographer’s caption: Young Mohammed Salam -- in the foreground -- travels regularly on iron ore hoppers through the Mauritanian Sahara, from the open-pit hematite mine centre of Zouérat, to the commercial port of Nouadhibou. The journey is precarious and exhausting, but free transportation of goods provides him and his colleagues with a way to make a living. The so called “Sahara Express” was completed in 1963, three years after Mauritania’s independence as a French colony, and it is considered one of the longest trains in the world. Exceeding 2.5 km long, it runs daily almost 700 km from the deep desert to the Atlantic coast and it takes about 17 hours. The 7.5 million tonnes of iron ore it transports every year in more than 200 freight cars, account for almost 50% of total exports, so it is vital for the Mauritanian economy, which has one of the lowest GDP rates of Africa. Photographer’s caption: I took this photograph on January 12, 2013, at Dusit Zoo, Bangkok during the Thai Children’s Day. 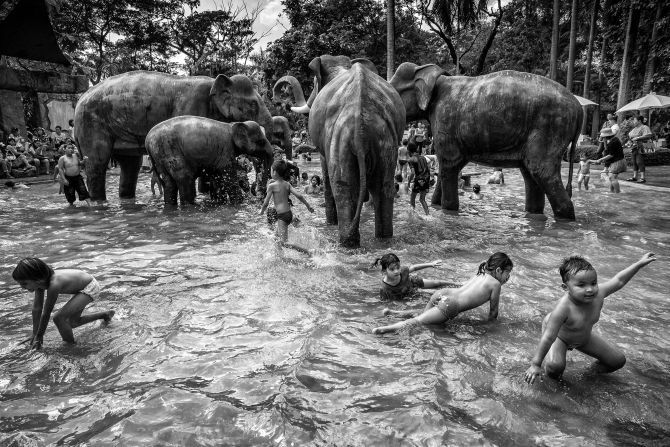 The authorities allow children to play at the fountain of the zoo, which they enjoy very much. I visited the place and wanted to capture the joyful moments of the children. 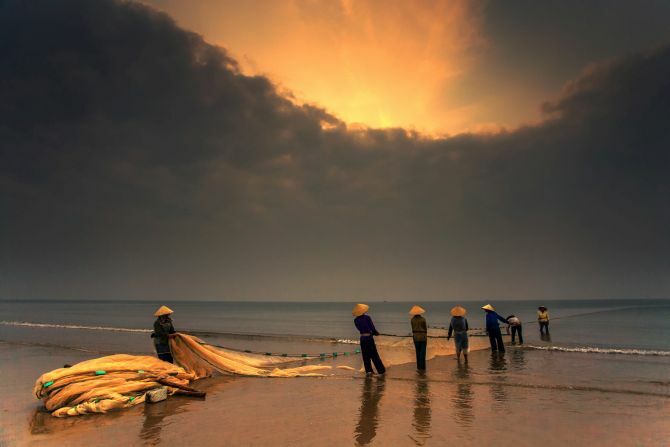 Photographer’s caption: The image was taken in the morning at the Haitien Beach in Thanh Hoa province in Vietnam. The fishermen were fishing before a thunderstorm. Photographer’s caption: The picture is a self portrait taken half a second after exiting the aircraft. I held the camera in my hand pointing it to the helmet to catch the sky and aircraft in the mirror of the visor. 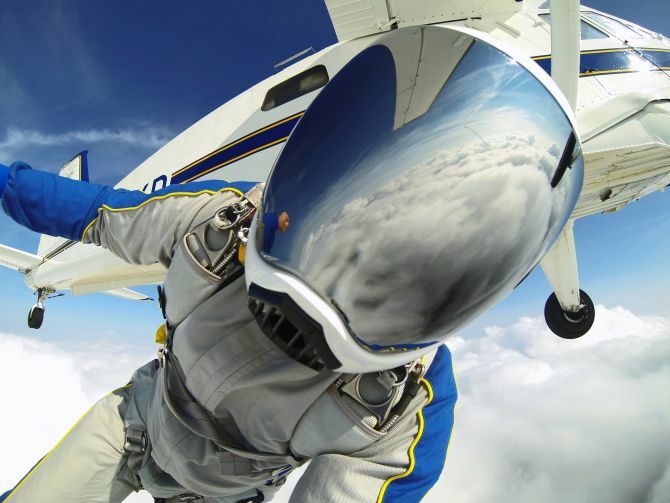 The jump was performed over Skydive Skåne DropZone in southern Sweden.